Rugs are an excellent way to update a tired space, add warmth and texture to a room. Thinking outside the square, there are many options to utilise rugs in ways you may not have imagined. 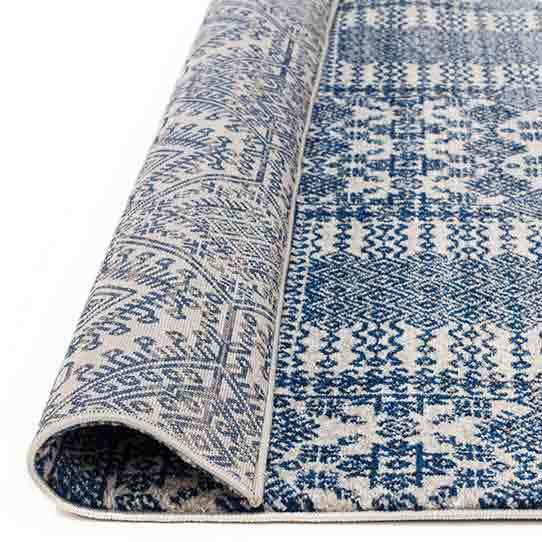 We’ve rounded up our favourite rug ideas which will certainly change your home for the better. 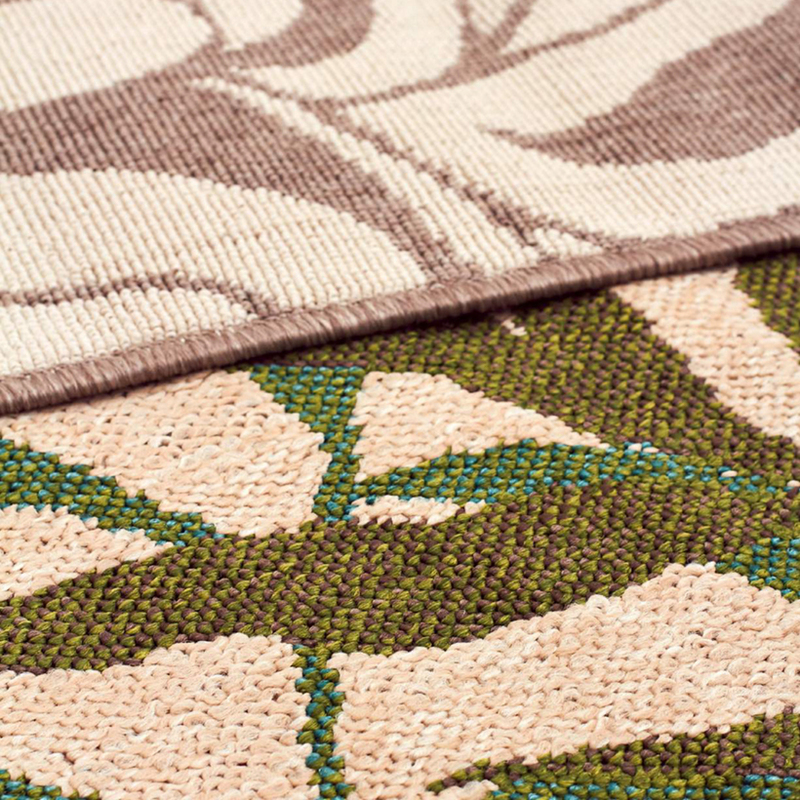 Heralding from the 70’s (and many, many years ago, tapestries) lighter styles of woven rugs pack a visual punch instantly. Textural styles, knotted variations and rugs which may appear hand woven work well above sofas, acting as a bedhead or replacing artworks in a hallway. 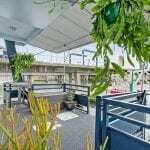 Consider hanging methods and what will be practical as well as beautiful. It will be a great absorber of noise too! 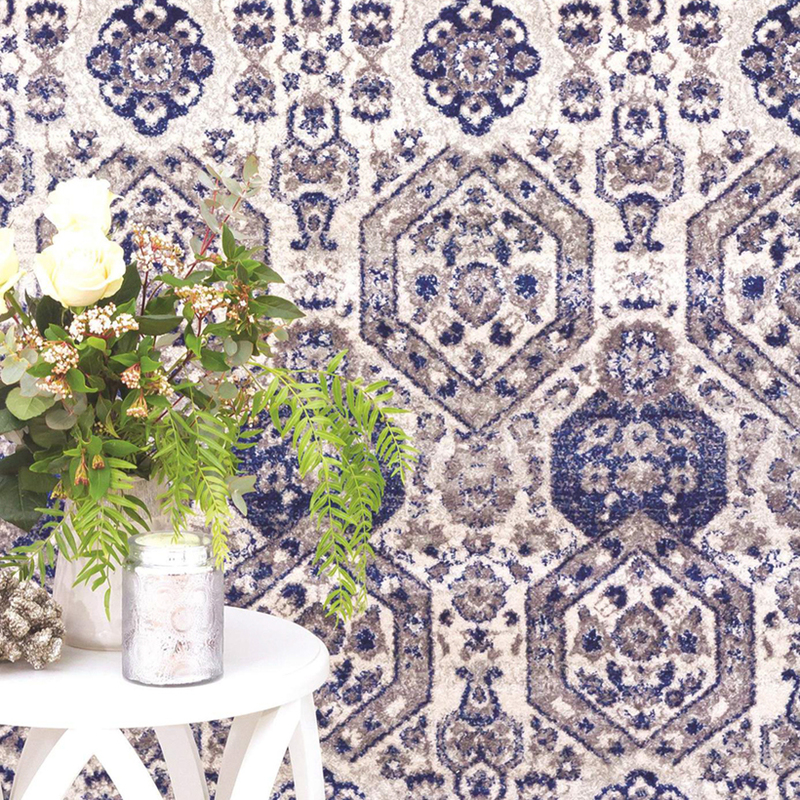 While not for everyone, this bohemian look will be certain to transform the space. Again, this is not a look for the faint-hearted. Layering rugs creates instant visual interest. Ensure that you are not creating a trip hazard by selecting flatter styles of rugs (at least the top rug anyway!). Try high contrast, such as a cowhide on top of a wool rug or two different colours or styles of flat weaves on top of one another. They can be layered in many ways, asymmetrical for a casual and eclectic vibe, or symmetrically for a more formal yet still quirky look. Kids spaces are an opportunity to bring colour, pattern and fun to a room. Be brave and use bolder options. They are also excellent at creating a barrier to the floor underneath- let’s be honest, with kids brings mess and spills! 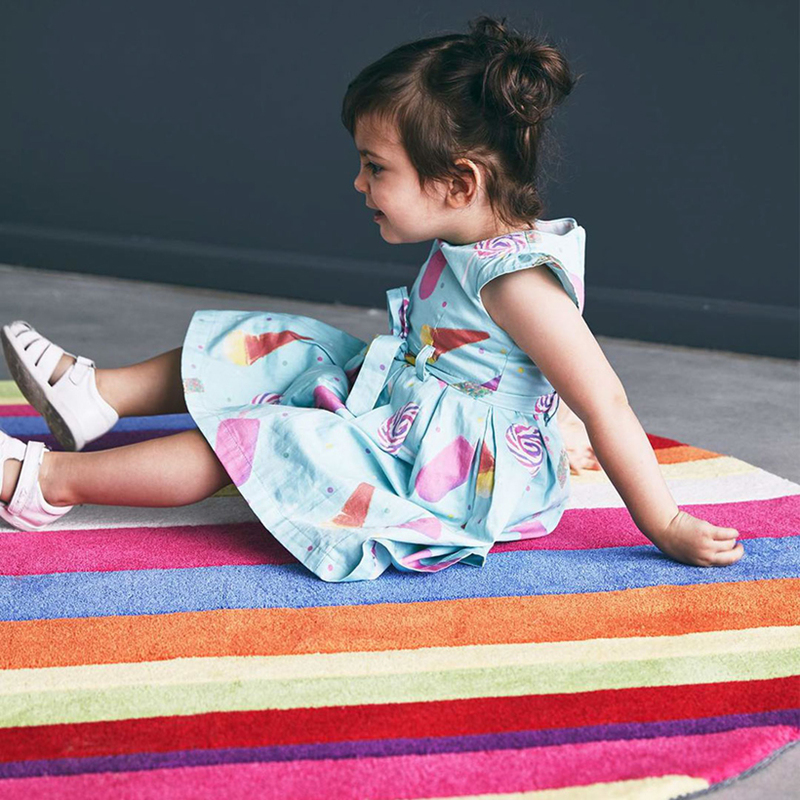 Protect your beautiful floor with a fun rug which your kids will love to sit and play on. Outdoor rooms, such as decks, patios and verandas can be made homelier and interesting with the inclusion of a specialised outdoor rug. Specific outdoor materials mean that they will be protected from the elements (sun, rain) while being available in so many fun patterns, colours and styles. For something different, choose a rug which is not linear. Round rugs, or rugs which are unusually shaped create a new direction for the interior instantly. Round rugs look particularly good in entryways or larger styles in informal living areas. They draw the eye around the space through their unique shape, certainly a dynamic inclusion to a home. Larger spaces, such as an open plan living/ dining can benefit from the subtle division which certain furniture placement and rugs will bring. Essentially, a rug used to create a room within a room is a temporary and less intrusive way to define what activities happen where. It can be beneficial in a smaller space too, such as a small rug underneath an armchair and lamp in a sitting room or bedroom. It can be daunting to make big interior design decisions which are bolder, like a strong colour or pattern. A rug is a great way to do this though. It’s not structural, meaning you can change it easily if you tire of it and it’s more cost-effective than paint or a new designer sofa. Have fun with rugs! 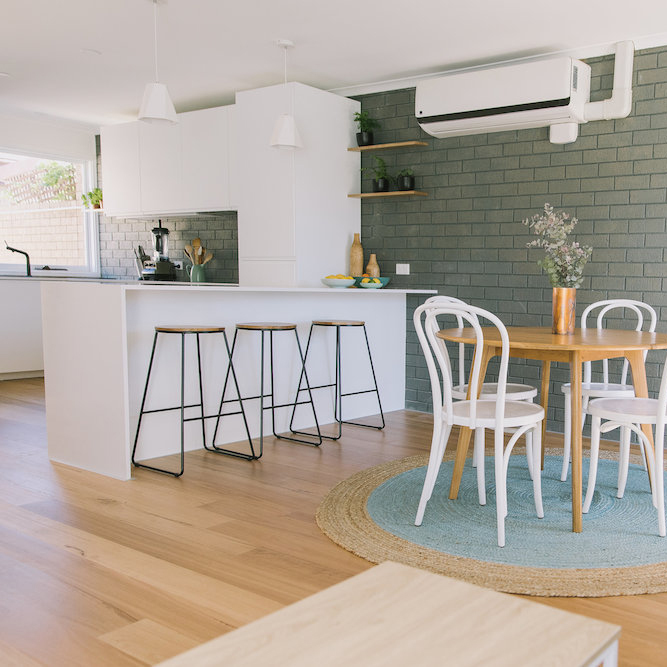 High contrasting colours, styles or patterns against the rest of your interiors is a clear way to experiment with interior design without breaking the bank. In such a high traffic area like a hallway, damage and general wear and tear is inevitable. With a rug in place, this will minimise these impacts. It’s also a room which is practical and often forgotten in a decorative sense. A beautiful runner will protect the flooring underneath but also take pride of place. Insert colour, texture and pattern into one of the most travelled rooms in the home. Hard flooring, such as timber or timber look is becoming increasingly popular in the bedroom. 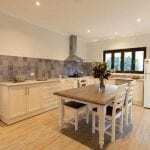 This makes sense for consistency throughout the home, but also aesthetically, the look is seamless and stylish. Having a rug sitting underneath the bed, jutting out slightly on the sides and base can provide a grounding look, however. It also feels excellent to place your bare feet each morning onto softness- particularly in the cooler months! Australia is blessed with such temperate weather in many parts and the picnic, or outdoor eating is synonymous with the warmer months. Instead of the traditional picnic rug, why not try an outdoor rug instead? It’s easy to clean, easy to maintain and available in so many colours, styles and sizes.